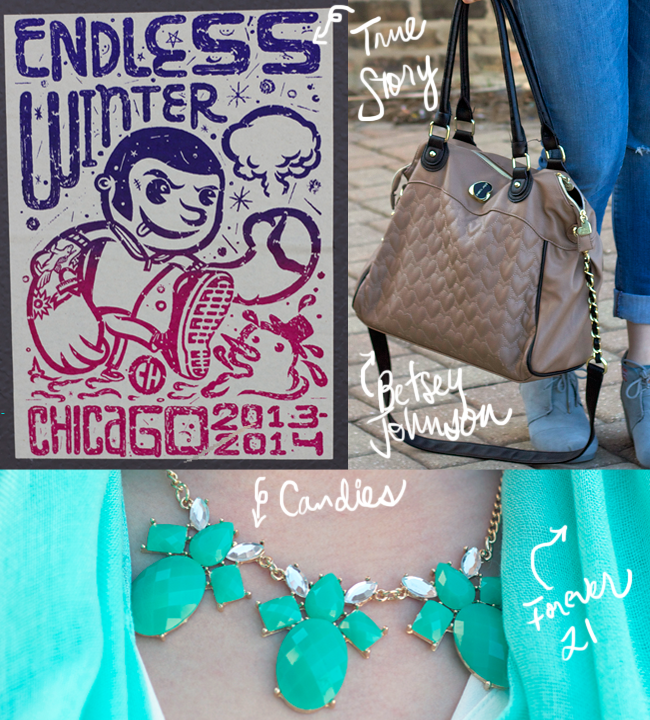 Frugal Fashion: Spring Is Here, Rejoice! Going outside without a coat and a scarf that’s only meant for decoration is so refreshing! This was one of the worst winters in Chicago history and I feel like I lived in the same tired DKNY down feather parka I’ve had for 4 years for months on end. As a California native, I’m quite shocked I can even go outside when it’s 50 degrees outside without a coat, but honestly- I’m relishing the sunshine and in some weird way, 50 seems so warm now. Since frugal fashion means you can’t go out and buy a ton of new stuff and need to make pieces work over several seasons. The jeans I’m wearing are a repeat offender since I’m picky about jeans that are low-rise. I’ve had these Levis for several years (that hole in the knee was earned) and like to cuff them when they’re warm , which is perfect for skinny jeans. 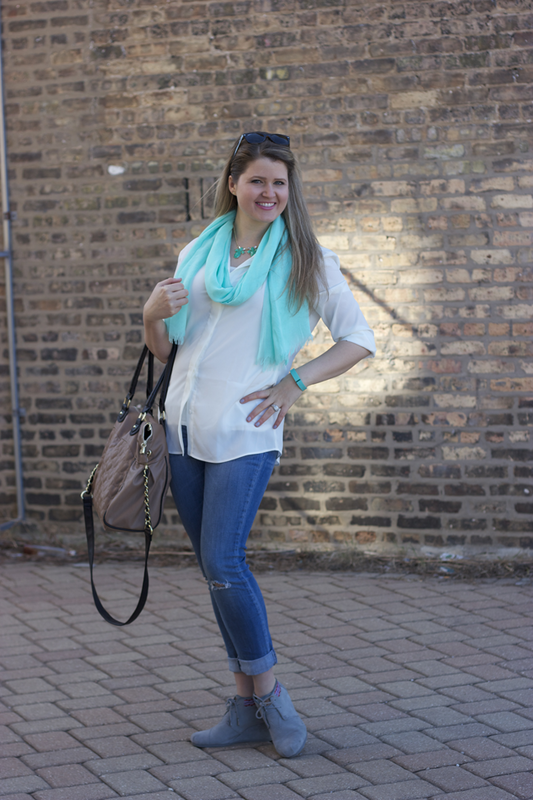 My other favorite transitional pieces are scarves and boots. These TOMS booties have been a winter staple, but work without socks for spring. They’re super comfy! I had to walk over to an interview with a Loyola student to talk about issues of debt & coincidentally, how I started my blog about frugal living, so I popped my new FitBit on (in Tiffany Blue!) and my TOMS to log some steps. I’ve been on a long shopping hiatus since well, weddings are expensive, but I’m working on incorporating little things here and there to freshen things up for spring. Accessories from Kohl’s and Forever 21 have been my go-to lately. Statement necklaces are my obsession lately since you can get one in every color and still not break the bank. I get giddy over simply taking walks in the sunshine with my lovie- it amazes me that the simplest things are usually the best things. 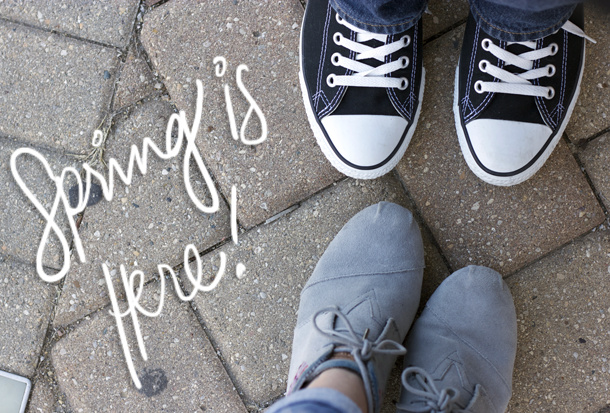 Simple things like sunshine, roaming around neighborhoods and comparing our shoes. Anyone else think guys in Converse are adorable? Or maybe that’s just the Doctor Who fan part of me talkin, because dude, guys in glasses with Chucks=hotness. That scarf really lights up your face. It’s a great color on you. I love how you made the Fitbit work with the rest of your outfit! I didn’t even notice it at first. Normally these trackers are a little too obvious, but with the right styling it totally looks chic!